Comanche National Grassland, 463,373 acres of preserved prairie and canyon lands, is one of two such grasslands in eastern Colorado (the other is Pawnee National Grasslands to the north). Comanche is part of the massive Pike and San Isabel National Forests and Cimarron and Comanche Grasslands, a 3 million-acre federal preserve spread through five western states. Comanche National Grassland is made up of two sections, Timpas in the northwest near La Junta, and Carrizo in the southeast near Springfield. Both are administered by the Forest Service. It’s a harsh environment, with annual rainfall between 12 and 17 inches, summer high temperatures above 90 and winter lows below 20. Visitors should bring plenty of water and cover up from the harsh sun. A full tank and can of spare gas are also recommended. Roads are mostly dirt and well-maintained, but throw a shovel in the trunk in case of a rare rainstorm. Canyon walls still carry the rock art, some as old as 8,000 years, depicting the hard lives of the ancient natives who survived in the area. Remains of their rock shelters and rock rings marking tipi sites can be found in the grassland. The white settlers who followed tried their hand at growing broomcorn in the arid climate. But the Dust Bowl discouraged most of them in the 1930s, and the federal government bought the land and allowed most of it to revert to its natural state. The Forest Service issues grazing permits to ranchers, as well. Picketwire Canyon, which includes one of the largest collection of dinosaur tracks in North America, petroglyphs and the ruins of early settlements. Petroglyphs in Picture and Carrizo canyons. Scenic Vogel Canyon with springs, ruins and rock art, a picnic area and eight miles of trails. Crack Cave in Picture Canyon filled with petroglyphs and rock carvings (open only to guided tours). A section of the Santa Fe Trail that first opened the West to trade and emigration. The lush birding in Cottonwood Canyon, with a campground. 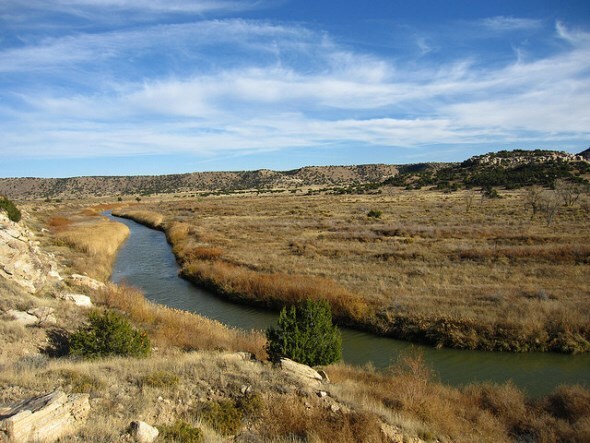 Primitive camping is allowed throughout Comanche National Grassland, except for Picketwire Canyon.